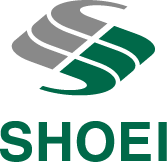 Company Profile | Development, Production and Sales of touch panels | SHOEI CO., LTD. The Gunma Bank, Ltd./ Saitama Resona Bank, Limited/ The Shoko Chukin Bank, Ltd./ Sumitomo Mitsui Banking Corporation/ THE TOWA BANK, LTD./ Mizuho Bank, Ltd.
5 minutes by car from Isesaki IC on the Kita-Kanto Expressway. Get off at “Isesaki Station” on the JR Ryomo Line. 15 minutes by taxi from the station. Get off at “Kojimachi Station” on the Tokyo Metro Yurakucho Line and walk 0 minute from Exit 2 of the station. Get off at “Hanzomon Station” on the Tokyo Metro Hanzomon Line and walk 6 minutes from Exit 2 of the station.